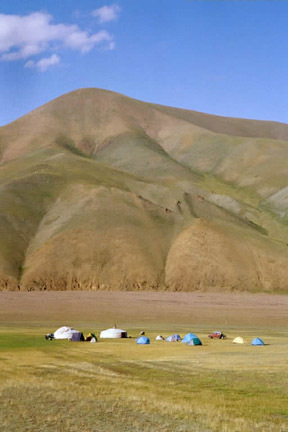 Base camp was located at 2225 m in the foothills of the Kharkhiraa Mountains southwest of Ulangom, the capital of Uvs aimag in western Mongolia. The Kharkhiraa and Turgen Mountains are the northeasternmost part of the Mongolian Altai. The Burgastai River a few hundred meters north of camp was our water supply. A similar distance east of camp is a placer gold mine; the geologist and miners there provided some logistical support (e.g., digging a trench across the fault scarp a few hundred meters west of camp). Two km northwest of camp is a coal mine. Although we slept in personal tents, we had one ger for a kitchen and another for dining and research. All student projects were within one hour’s walk and/or drive from base camp. We used two Russian jeeps and two Toyota four-wheel-drive vehicles to study faults in all directions, and to go northwest to the high Kharkhiraa Mountains where three students conducted research. Four student projects were within walking distance of camp. The mostly Paleozoic rocks include marine and continental conglomerate, sandstone, mudstone, limestone, and volcanics, some of which have undergone low-grade metamorphism. Granitic rocks dominate the peaks which rise to about 4000 m. The rocks were folded and faulted as the Chinese and Siberian cratons collided in the Paleozoic and Mesozoic. Thrust and right-lateral Cenozoic strike-slip faults dominate the foothills between the Kharkhiraa and Turgen Mountains to the west and the Uvs Nuur basin to the east. Their scarps breaking alluvial fans, these north-south active faults have normal and thrust components as they bend east and west. Coal and placer gold mines are worked in the foothills. Long valley glaciers radiated from the high peaks. Striated boulders and bedrock indicate that the glaciers were partly warm-based despite the cold climate. During retreats and readvances they left many terminal and lateral moraines from the Late Glacial Maximum until today. These moraines were and/or are ice-cored. Glacier snouts are covered with so much rock debris that they behave like rock glaciers. Thick aufeis that accumulates on parts of valley floors during the long cold winters produces cobble pavements. Freeze-thaw of the active layer above the permafrost has contributed to widespread patterned ground, including steps, stripes, circles and polygons. Large sorted polygons are bordered by granitic boulders. Quaternary climate fluctuations have led to changes in rates of mass wasting, loess accumulation, and fluvial erosion and deposition. Overgrazing is a major cause of terracettes, mass-wasting, and increased fluvial erosion and deposition. On steep slopes, solifluction, slumps, earthflows, and debris flows are common. 6. quartz-rich conglomerate with interbeds of coal and tuff. 1. turbidites with individual beds 0.1-1m thick. Basalt flows occur within units 3 and 4. Hyaloclastites and pillows in the basalt indicate shallow subaqueous eruptions. This stratigraphy of progressively shallower-water environments represents a marine regression associated with subduction related orogeny. 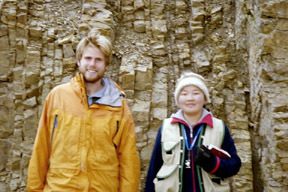 Russian geologist mapped units 1 and 2 as Ordovician; but fossils of possible terrestrial plant material suggest a younger age. The rocks have been deformed by large-scale asymmetrical folding with hinge axes oriented northwest-southeast. Small scale parasitic folds have many orientations. Two principal faults, one normal and the other reverse, do not seem to relate to contemporary tectonism. 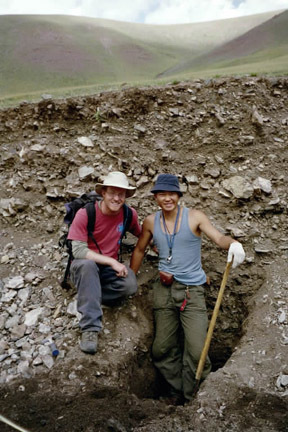 Located in the Black Marmot coal mine area of the northeastern Kharkhiraa Mountains, a thick accumulation of conglomerates represents a depositional environment that fluctuated between marine and terrestrial conditions. Approximately 35 diverse conglomerate units demonstrate cyclical variance in grain size, fabric, rounding, color, matrix, and cement. Shale, coarse-grained sandstones, coal beds, and welded tuff make up approximately 15 interbeds. Clasts in the conglomerates consist mostly of quartzite, quartz, sandstone, greenstone, and conglomerate clasts though a few units have limestone and volcanic clasts as well. Rocks similar to those found in the conglomerates make up the older Paleozoic terrane in this area. The interbedded conglomerate coal/shale sequence suggests an estuarine setting subject to frequent flooding from local highlands. Successive movements along the Jid Fault have controlled drainage patterns in the adjacent basins. The Jid Fault is a north-south trending right-lateral strike-slip fault with a vertical component of motion (both normal and reverse) introduced by bends in the fault. Along the southernmost 5km of the fault, normal movement accompanies the lateral movement. Subsequent down dropping of the eastern block, of which the last event has been preserved as a 1m scarp, contributed to the formation of a wide basin and resulted in the damming of south-flowing drainage to create a lake. Approximately 5km north of the lake a restraining bend in the fault has caused local uplift of the eastern block. This uplift is inferred from the presence of diverted and abandoned stream channels and the apparent beheading of south-flowing drainage. Alluvial fans in the southern drainage basin have experienced stream channel incision and nick point migration. Filling of the basin by fan deposition and reduction in catchment area have reduced stream channel gradients and produced marshes and shallow lakes. In the 9-km long basin along the northern section of the fault, strike-slip motion dominates drainage morphology; east-west trending shutter ridges have caused stream capture, abandonment of channels, and lateral displacement of alluvial fans. The Jid Fault is a 60km long right-lateral strike-slip fault. A 15-km long section of the fault between N49º27’32.6” and E91º43’25.1” appears to be almost pure right-lateral strike-slip to the north with a thrust component introduced further south as the fault changes orientation from trending north-south to northwest-southeast. At this change in orientation, the fault splits into three north-south splays. The westernmost segment appears to be mostly right-lateral strike-slip while the middle segment has a normal component of motion. The eastern segment follows an anticlinal ridge and has a thrust component. The three parallel fault strands probably form a flower structure of numerous fault strands narrowing into a single oblique strike-slip fault at depth. Well-preserved earthquake ruptures take the form of alternating tension cracks and pressure ridges which represent failure of the top few meters of soil cover in response to strike-slip motion at depth. Extension fractures in areas where the fault has a substantial thrust component are caused by collapse of the scarp. The north-south trending Jid Fault in the Mongolian Altai is a right-lateral strike-slip fault. From N49º33’8.3” E91º43’26.2” to N49º27’32.7” E91º43’24.9” the fault changes from a high-angle normal fault in the northern 3 km to a high-angle reverse fault in the southern 7 km. The fault is uplifting on its western side. 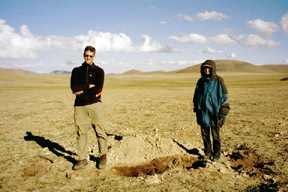 The Mongolian Altai is a compressional environment, so similar shortening is expected along the Jid Fault. The assumption is supported by the fault bending at an angle to the north-south slip direction. A trench at the southern end of the studied section showed clays against bedrock dipping steeply west, supporting reverse motion. Oblique normal motion along the northern 3 km of the fault is supported by an abrupt change in orientation to northeast-southwest; in deep alluvium here there are earthquake ruptures away from the base of the range. Small grabens at the base of scarps are present along the northernmost km; a trench in an alluvial fan exposed silt against colluvium, with the contact dipping 80º east. The Jid Fault is active and capable of generating large magnitude events. The most recent earthquake ruptures are still observable. Offset alluvial fans indicate cumulative Holocene activity which can be used to estimate an average slip-rate. The alluvial fans have an average horizontal offset of 15 m and vertical offset of 5 m. If the fans were last active during the last glacial maximum about 15 ka, a slip rate of 1 mm/year can be calculated. The glacier in the compound cirque at the head of the Ugwi Yamaa Valley (UY) flowed about 9km northeast to become a tributary to the much larger glacier I the valley of the Kharkhiraa River (KR). The moraines were deposited from after the Last Glacial Maximum (LGM) to the Little Ice Age (LIA). 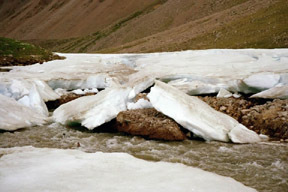 The maximum extent of ice in the Kharkhiraa Mountains is recorded by drift about 16km to the east on a Tertiary erosion surface. The oldest recognizable lateral moraines of the UY glacier crown valley sides and probably record a retreat from the LGM position. At the mouth of the UY valley, the stream has cut through a 20m high terminal moraine and 20m of bedrock. This moraine appears to be on top of drift deposited by the Kharkhiraa glacier during retreat from its LGM position far down the KR. Terminal and lateral moraines record both back and down wasting retreat of the ice; it is difficult to determine which moraines indicate pauses in recession versus readvance. The lateral moraines have been modified by mass wasting and streams; landslides, solifluction lobes, and alluvial fans are common. Hummocky moraines and young collapse pits suggest that Neoglacial moraines were and/or are ice-covered, like the modern terminal and lateral moraines. Striated bedrock and boulders indicate that the UY glacier was at least in part warm-based despite extremely low temperatures. Three types of patterned ground exist on gently slopes in the Kharkhiraa Uul. Stone-bordered polygons and cobble mounds are on drift at an elevation of 3000m. Earth hummocks lie both there and also in lower (2200m) unglaciated valleys. Regularly spaced stone-bordered polygons have diameters of 5-8m and up to 35cm of relief; cobble mounds range from 0.5 to 2m in diameter and have up to 25cm of relief. Both exhibit evidence of frost heaving and creep of coarse granite clasts. Sediment in stone-bordered polygons is well sorted whereas cobble mound sediment is generally poorly sorted. Earth hummock diameters are mostly less than 0.5m (with exceptions up to 1.5m); they are generally 15-20cm high (but as much as 47 cm). Evidence indicates formation of earth hummocks through a process involving seasonal growth and decay of ice lenses in silty soil. Stone-bordered polygons are quite deformed on the slopes of old lateral moraines. 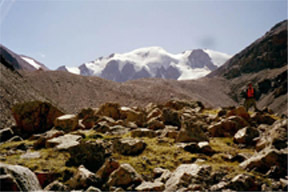 The slopes of the Eastern Kharkhiraa Mountains are currently undergoing a period of dramatic instability triggered by climate change, increased runoff from mining operations, and/or overgrazing. Ten to twenty degree vegetated slopes with large accumulations of colluvium fed by talus upslope are the most susceptible to failure. Earth flows are 10-20 m wide with convex, vegetated toes 1 m high undergoing solifluction. Debris flows are characterized by natural levees and occur on steep slopes and valleys. Many slopes and valleys exhibit multiple generations of mass wasting. Peat beds (up to 10 cm thick) alternating with loess, alluvium, and/or colluvium indicate cycles of stability-instability which may represent changes in paleoclimate. At an elevation of ~2900m in the glaciated Ugwi Yamaa Valley (N49º34.63’, E091º 27.23’), aufeis covered an area of ~60,500 m2 in mid-July, 2004. This laminated ice sheet developed on a braided stream channel that is constricted by a small canyon below the sheet. The aufeis had a maximum thickness of 4.3m. One 2.15m section of the ice had 90 laminations while another section of 2.35m had 64. There are three different types of ice: equidimensional crystals, candle ice, and plate ice. Equidimensional crystals dominate ranging from 3-12mm. Candle ice, vertically oriented cylindrical ice, occurred both in beds (1-5cm thick) and in lenses. The candle ice lenses have flat bottoms and convex tops, and can be as thick as 35cm resulting in candle ice of that length. The plates of ice are amalgamations of crystals that clip downstream at angles between 40º and 65º. Between July 21 and 29, 2004, the stream was blocked by the ice and eroded a cut bank 3.90m high. Evidence of similar past erosional events indicates that aufeis played an important role in widening the channel. Alluvial clasts under aufeis have responded to the load by preferentially aligning so that their flat surfaces create an alpine sub-aufeis cobble pavement. The northeastern Kharkhiraa Mountains contain a wide variety of continental and marine sedimentary rocks, some with scarce fossils: conglomerate, sandstone, mudstone, dolomite and limestone. In places these rocks have experienced low-grade metamorphism to become phyllites. Locally massively-cored lava flows, pillow lavas, hyaloclastites, and tuffs are associated with the sedimentary rocks. The high mountains are dominated by at least three granitic plutons, with gneiss and migmatite in places. A general regressive stratigraphic sequence in an orogenic setting is preserved in the Late Paleozoic terrane of the field area. Unusual associations of congolomerate and coal shale, plus turbidites bearing coal fragments, contribute to an unusual picture, the closest contemporary analogy of which might be a river plain/estuary/bay environment flanked closely by volcanic mountains as in coastal Japan today. The Jid Fault has deformed and in some manner contributed to alteration of the earlier-folded and faulted Paleozoic section in a zone around the fault trace ranging up to a kilometer wide. Asymmetrical folding of Paleozoic strata suggests multiple deformation events. Fold limbs on the eastern edges of synclines are nearly vertical, while the opposite limbs of these folds dip gently. Hinges are nearly chevron in form, and hinge traces bend from NE-SW to NW-SE across distances of only a few hundred meters. Numerous large “parasitic” folds lie within the larger, kilometer-wide folds that cross the best area of exposure, near the Black Marmot coal mine. The foothills of the mountains are host to operating coal (Carboniferous) and placer gold mines, with potential for gold in the bedrock. The right-lateral strike-slip Jid Fault trends north-south for more than 50 km. With local normal and thrust components as it bends northeast and northwest respectively, it exhibits mole tracks, pull-apart basins, and forebergs. The last rupture was perhaps 103 years ago, based upon states of scarp preservation and preliminary trench investigations. Intermontane valley development and river histories are strongly controlled by tectonism along the Jid Fault. River piracy and alluviation in beheaded watersheds have been especially important. The Jid Fault is a dynamic system, with numerous splays accommodating strains at bends in the presently active main fault. We view the total system as continuously unstable and evolving, possibly in response to large fault block movements elsewhere in the region. Stream incision and deposition are highly sensitive and readily expressed in the vertical offsets caused by the Jid Fault where it crosses the alluvial fans and pediments of the field area. This is likely expressed in trench cuts as gravel wedges trending from upslope paleoscarp offsets. During overall retreat from the Late Glacial Maximum to the present, glaciers left many terminal, recessional, and lateral moraines recording times when the ice readvanced and/or was in equilibrium. Slope instability is wide spread: debris flows reach valley floors; earthflows and steep slopes are undergoing solifluction. Sediments in stream cuts provide evidence for alternating stability (organic-rich and loess soils) and instability (alluvium and colluvium). A wide variety of sorted and non-sorted patterned ground exists: steps or terracettes (directly and indirectly influenced by overgrazing), stripes, stone-bordered polygons, circles (with apparent mud eruptions), contraction polygons in turf, and earth hummocks in wet, fine-grained soil. In addition to the growth of segregated ice in a periglacial environment, the uplift of the centers of circles and polygons in patterned ground may be due to fine-grained sediment from spring dust storms filling low-temperature and desiccation cracks. Thick winter aufeis persists through the summer and locally strongly influences valley floor morphology, causing cobble pavement beneath it and enhanced stream erosion and mass-wasting at its sides. I’ve been awake since the sky was full of stars; dogs near Ulangom in western Mongolia barked all night (after sleeping all day). There’s a pink and orange sky to the northeast over Uvs Nuur, Mongolia’s largest lake, by area. Venus and a half moon still shine brightly. The horses around me munch quietly on the overgrazed grasses. To the south are two jeeps with trailers, two four-wheel-drive Toyotas, a big truck, and 28 others in sleeping bags. Only the stack of the coal-fired power plant rises prominently above the low skyline of Ulangom, the aimag capital, to the northwest. Low hills are silhouetted to the east; the snow-capped Turgen Range rises to almost 4000 m on the western skyline. Our campsite is just below 1000 m, which is 200 m above Uvs Nuur. Dawn brings the sound of a crier in a minaret at a mosque in Ulangom. Perhaps it is a recording blasted over loudspeakers. The sound mixes with the canine barks and occasional vehicles of early morning. 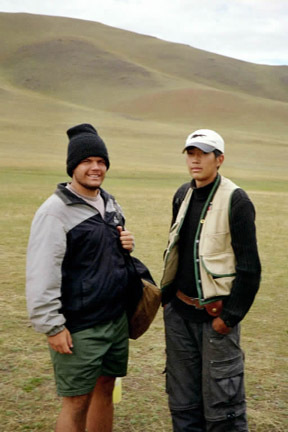 Kazakhstan is not far west; many Kazaks with their Islam religion inhabit for western Mongolia. The Russia-Mongolia border crosses the northeast corner of Uvs Nuur, but the lake is so big one cannot see across it. 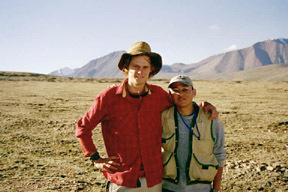 Nearby Tuva is close to the point on Earth farthest from any ocean. But gulls and terns are among the great variety of birdlife along the shores of Uvs Nuur. I’m reviewing this past wonderful month in western Mongolia. Our “base camp” lay at an elevation of 2225 m on the east side of the Kharkhiraa Mountains in the northeastern Mongolian Altai. These foothills are cut by major north-south faults separating the Uvs Nuur (lake) basin to the east from the Turgen/Kharkhiraa Range to the west. Camp is almost on one of the 2 largest faults, which runs many km north and south. Just to the east is a placer gold mine which operates 24 hours a day for the 6 months of “summer”. We got a tour by the (female) chief geologist, and saw frozen ground (permafrost) in the mine floor. A few km to the west is a coal mine which operates during winter months, when Mongolians need coal for heat and electricity (there are few or no other sources of energy in Mongolia). We have not seen trees for weeks: everywhere is grass, except rock outcrops and where overgrazing has caused slope instability. Many slopes have terracettes, most apparently directly or indirectly caused by overgrazing. 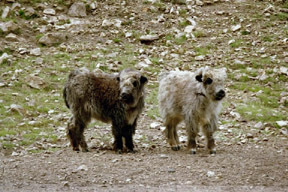 We see cattle, yaks, horses, sheep, and goats all over the place, with camel herds here and there. Regularly there are goats and sheep grazing by camp. One morning I woke Clare early because I though she was grating her teeth; she thought it was someone walking by our tent, but it lasted too long. We opened the fly to see a grazing yak a few meters away. Wild flowers accompany the grasses - fewer (like edelweiss) at this elevation and more in meadows 500 m above us. Above this are some of the most beautiful mountains I’ve ever seen. Occasionally we drive (for research purposes) to the pass between the Turgen Mountains to the north and the Kharkhiraa Mountains to the south. Each massif has giant glacial troughs radiating in all directions. At the heads of these troughs are large glaciers, particularly on northern slopes. The snouts of the glaciers are buried in rock debris - down each valley goes a small river carrying outwash. Some glaciers are on the summits of flat-topped mountains; down the sides are ice fields and hanging glaciers. 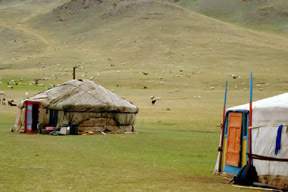 Scattered throughout the countryside are white gers, one to a few per Mongolian family or extended family. Transportation is by horse, or motorcycle. There are a few big trucks to haul wool after shearing, or move the family (and its ger) to lower elevations for winter. The people are very friendly, inviting us in to their gers for yak cheese, airag (fermented mare’s milk), salty tea, or whatever. We often have something to give: a pen, a balloon, or chewing gum or candy. They are curious as to what we are doing, and to the nature of our instruments. Our party includes 9 American, 1 Swiss, and 9 Mongolian students; 2 Mongolian drivers with Russian jeeps; 2 Mongolian cooks; 2 U.S. geology profs (Rick and me), Clare, 1 U.S. doctor and his wife, 1 assistant from California, plus Mongolian (1) and British (1) profs. There are 2 Toyota “land-cruisers”; Bayasaa told another driver not to come with his Russian four-wheel-drive van until it was fixed. Here are the American research projects: 3 along the fault (when was the last earthquake? ), 2 on local rocks, 1 on nearby landslides (which are varied and spectacular), and 3 at high elevation (1 on patterned ground, another on aufeis, and a third on moraines). 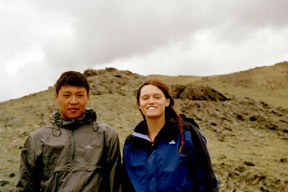 Mongolian student are assisting with most of these research projects. The weather is tough; we’ve had 1 or 2 days with no rain, otherwise lots of rain, with occasional hail, high winds, thunder and lightning. One day it hailed so much that there was the appearance of snow on the ground. The lightning is likely dangerous only when we’re on ridges; once Clare and I had less than one second between the flash and the bang. Temperatures have been as low as 40ºF, which yields freezing considering wind chill. A 60ºF temperature feels great when the sun is out. Field work is hard in low temperatures and/or rain, especially if one is not moving much. During rare cloudless hours, the icy mountains are spectacular. Two research projects are a little risky because the field areas are over a ridge and down in a deep valley from as close as vehicles can get. We always have at least 2 people at each research site; those in the high valley have CB radios to maintain contact. Each day groups walk to nearby projects or go by vehicle to remote sites, as far as an hour away. The only real road leads east to the Uvs Nuur basin and west to a village and the coal mine. There are “tracks” all over the place; vehicles follow the tracks or just go “cross-country”. There are no bridges, even on the road. The van had lots of traction problems; a Toyota got really stuck once, but digging, putting rocks in the ruts, pulling with the other Toyota, and pushing with people got it out of the muck. The jeeps are best, especially because of their high clearance. Three types of patterned ground are common. The mounds of soil, vegetation, and rocks merely yield a bumpy ride. 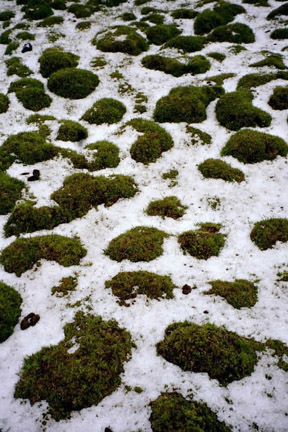 The vegetated frost mounds (“hippie heads”) result in a very bumpy ride, or if soft, a stuck vehicle. The stone-ringed mounds with boulder edges are about impossible to cross. Around the camp are steep grassy slopes, including Sacred Mountain north across the valley. Many of us climbed this mountain, which rises about 500 m above the river where we get our water. The river flows past the town upstream of us, plus there are livestock everywhere, so we have to purify our water. Sacred Mountain’s top is often in the clouds; there is an ovoo and a stone altar on the summit. Meals are good, but similar, every day. Breakfast is tea (and instant coffee), juice every other day, thin cream of wheat, cornflakes, granola, bread and spreads. Lunch (in the field) is tea, bread, sardines, cheese, and perhaps meat and/or an apple. Dinner is tea, meat and vegetable soup, pasta with meat and vegetables (or sometimes meat with rice or potatoes), and canned fruit every other evening. We have two gers: one is the kitchen, the other is for everything else, dining, research, talking, games, reading, etc. The “other” ger leaks like a sieve during rainstorms, but beats being pelted by raindrops and hailstones. The storms come from the west; afterwards there are spectacular lightning displays to the east. My favorite place is the high valley where the glacial and aufeis projects are located. I was fortunate to be able to visit this most beautiful site half a dozen times, with bad weather only the day Clare joined me. The students have named it “No Goat Valley” because no sheep or goats go there – no overgrazing. The valley floor is lush with grasses and wildflowers, plus a tiny bush with green leaves and red flowers. Dozens of tiny streams and a big spring feed the braided river that has carved two canyons through phyllite. Some of the lichen-covered granite boulders are striated. At the head of the valley is a compound cirque with many glaciers descending from snowy rocky peaks. Light and dark clouds dance across the bright blue sky. The only sounds are the wind, the river crashing over rocks, and occasionally, an icefall from a hanging glacier. 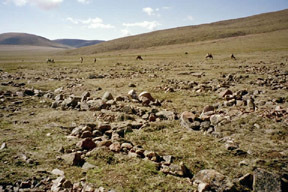 The only evidence of visitors is a little horse and yak dung, and scattered cairns. Moraines wind across the valley floor and sides, and a large patch of aufeis lies above the upper canyon. I have never been anywhere more beautiful or remote. John W. had climbed a nearby peak a few days ago. We somewhat hurriedly left base camp at 2225 m at 9am, 6 crammed into a Russian jeep, enduring an hour of rocks and ruts, hill and stream crossings. 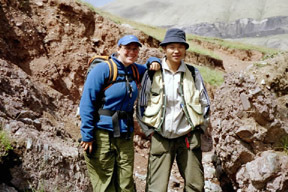 The jeep was “parked” on the northeast side of a valley with a small stream and lots of patterned ground, with gers, Mongolians, sheep, goats, and camels down valley above a canyon. We walked southwest across the broad valley, hopping on rocks, walking on grass and wild flowers, jumping over tiny weeks, and beginning the ascent at about 2850 m.
The northeast side of Cirque Mountain, as Clare named this peak, is a huge pile of bedrock and frost-shattered boulders undergoing landslides and solifluction. Patches of grass near the base become few and far between – these are stable stepping places. They are replaced by smaller patches of moss on thin soil as one ascends; but the upper 500 m of these mountains in the Kharkhiraa Range has only lichens for plants. The only animals we saw were occasional spiders and raven-like birds. I ascended the way Clare did a few days ago when she reached perhaps 3200 m. It surprised me that I could more or less keep pace with Nick from Carleton College, Martin from Whitman College, Laura from Princeton University, and Moyo from Mongolian University of Science and Technology. Franco from Switzerland was way ahead of us much of the day even though he made side trips for photography. The ascent involves finding rocks that won’t move on a giant unconsolidated staircase; small rocks that slip down under a boot cost energy that shouldn’t be wasted. To the southeast is a large cirque with a shrinking beheaded glacier that is the main source of the stream in the valley below. Most of last winter’s snow is gone, the surface replaced with dust from spring storms. Higher up the ridge we go, eventually seeing the huge glacial trough to our northwest. The head of this deep valley is full of glaciers and moraines: hanging glaciers, cirque glaciers, valley glaciers with lateral and medial moraines. Just down valley from this beautiful ice is a gigantic ice-cored terminal moraine that behaves like a rock glacier. The melt water from the glacier complex disappears under the “rock glacier” and reappears near its snout, flowing down valley under aufeis, between many lateral moraines, and through two canyons before reaching the Kharkhiraa River to our north. The summit of Cirque Mountain is a nearly flat block field about the size of Whitman’s Ankeny Field. To the south is a giant glacier wasting away, but still feeding ice to the southeast glacier in the valley where Nick and Martin are doing their research. We gawked at and photographed the glacier-mountain complex in and above the valley almost a km below us, then decided about where the high point of our small rocky plateau lay. There we built a cairn or ovoo of granitic boulders, and ate our lunch of mostly bread. It was warm and almost windless; dark clouds were in all directions, but lightning never came. Mostly the sun shone on the rocks and glaciers. After an hour on the summit, we spent over 5 hours descending, by a different route. First we went south to the huge snow field-glacier, and walked southeast near its margin, looking at the meltwater on and at the edge of the ice. Next we crossed the rock and snow between this glacier and the beheaded glacier in the cirque we planned to circumnavigate. 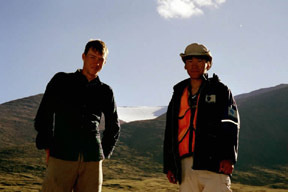 Bayasaa and five other Mongolians had driven up to the high valley shortly after us; they had climbed to the snout of the beheaded glacier for lunch. Our next stop was the top of a huge northeast-facing empty cirque. By empty I mean no more glacier, only small moraines from the Little Ice Age. Then we slowly descended the ridge between the two cirques – slowly because of the very long slope of unstable rocks. Such descents are very tough on knees – particularly old knees. We crossed mafic dikes cutting the pink “granite”, and many mass-wasting features. It was quite a relief to get off this steep loose rock. The stream issuing from the beheaded glacier cascades over boulders hundreds of meters down from the ice to the valley floor where we started. On either side of this torrent are grass patches and lines of frost-moved stones. We took off our boots, washed our feet in the near-freezing water, and lay in the grass, waiting for Bayasaa and company to return from the cirque with the beheaded glacier. Then we all crossed the valley floor to the four-wheel-drive vehicles. 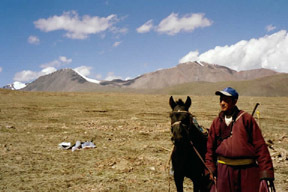 Many nomadic Mongolians left the high valley that day, with gers and other belongings on a truck and a camel caravan. They drove their sheep and goats to lower pastures; winter comes early in Mongolia. The only traces of their summer home were two sculls – one camel and one human.